Bacon & Maple Syrup Make Some Tasty Lolly-Pops! The way Jason, the confectioner of Lollyphile, tells the story of his lolly-pop business, he and friends were just fooling around one day and came up with the idea to make an Absinthe lolly-pop. (Something about having an abundance of Absinthe and no candy.) That day was only this past October, 2007. 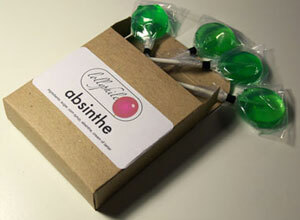 Once tasted, twice desired; the Absinthe lolly-pop was a hit, so Jason started making and selling them to a few retail shops. Then came the Maple-Bacon, a flavor that makes you feel like Sunday mornings no matter when you taste it. And the fulsomeness of this bacon-bitted pop just could be from the real maple syrup and real bacon used to make the Lollyphiles. After all, they are made with pure Vermont maple syrup and "sustainable, organic, cured bacon." And, don't worry, there will be more astounding Lollyphiles. There are several surprises right now in the wings. The Lollyphiles cost more than your average sucker, but they are worth it. If you don't devour all your pops, you can surprise a few of your very special friends and watch their pupils dilate as they recognize the taste. Most likely, they will say, "Oh, my god! Where did you get these? I have to have some!" Okay, I won't keep you waiting. Here is your secret page to order Maple-Bacon Lollyphiles before Thursday, April 10, 2008. No telling how long they will last! 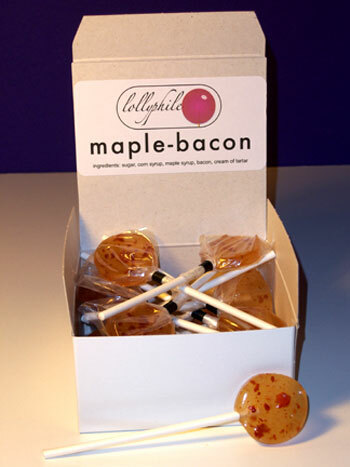 After April 10, you can purchase the Maple-Bacons and the Absinthe Lollyphiles directly from the Lollyphile website.